At the end of our Pt.9 update we were ready to lower the rear of the caddy! Last minute plans were made with our good friend Mark to get the axle flip kit and air shocks installed. Shortly after arriving at Mark’s home Saturday morning we positioned the truck in the garage, jacked up the rear end, and removed the old shocks and u-bolts. 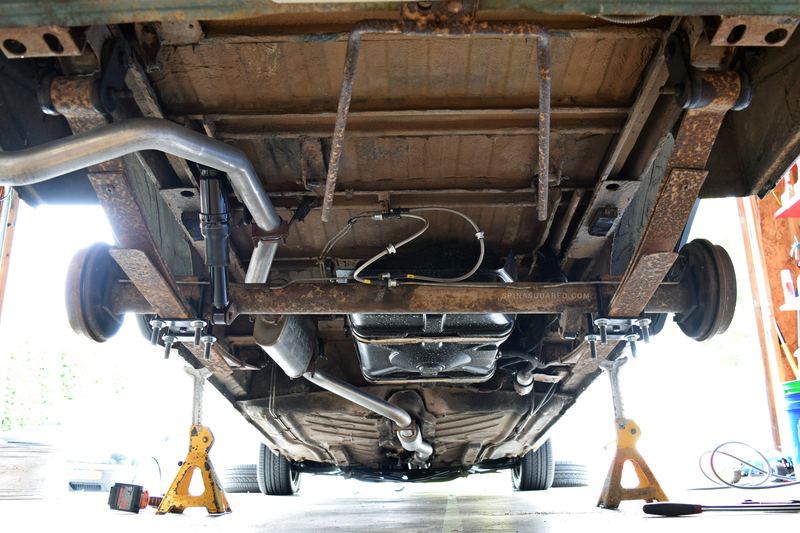 The rear beam was re-positioned above the leaf springs and fastened into place with the “King Pin Axle Flip Kit” from CaddyPan.com. Aside from swapping one of the bushings and inserts from the old shocks to the new air shocks, a chore Mark had no problem tackling, the install was pretty straight forward. Air lines were fitted to each shock then connected to a schrader valve Mark placed behind the fuel filler door. After a couple of hours the rear of the caddy was sitting just right! All we have left is to install e-brake cables we had “on hold” until a decision was made between an axle flip or drop plates, then work more on cleaning up that interior. In fact, we’ll be checking out a pair of Mk2 GLI Recaro seats someone posted up for sale and will likely pick them up. Then it’s a slow process of tackling the exterior but for now we look forward to putting this caddy to good use with work around the house and the occasional commute to work, especially when the weather gets bad and we want to keep the other two cars clean and stored in the garage. We will of course continue to update you with progress as this project develops.